This day falls on the 15th day after the Spring Equinox, which is either the 4th or 5th of April each year. The day is often refered to as Qingming or Ching Ming Festival and is a time to observe and remember your ancestors who have passed on. This can include the sweeping of their graves and offering of food and other forms of honor and remembrance. 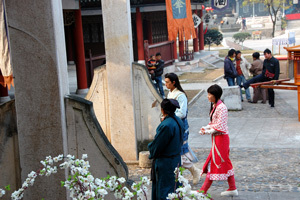 More recently the holiday relates to when Emperor Xuanzong of Tang noticed too many extravagant ceremonies being held for ancestors and so he declared to have all the cereomonies once a year on Tomb Sweeping Day (Qingming).